Top 2 left: Blue Lilac & Lemongrass Cross ~ Layered clear glycerin & goats milk soaps scented with Lilac & Lemongrass sparkling with blue mica powders. 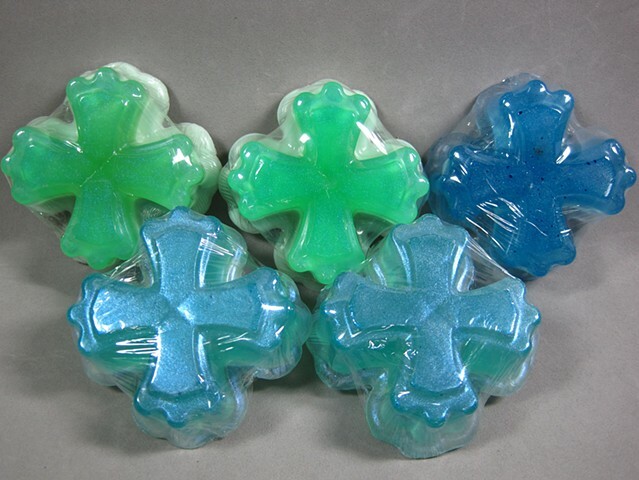 Top Right: Barreme Lavender Cross ~ Olive oil soap scented with high quality Barreme Lavender essential oil, sparkling with suspended blue mica powders. Bottom 2: Lavender & Black Amber Cross ~ Olive Oil soap scented with Lavender & Black Amber fragrance w/ blue colorant dusted with blue mica powder.